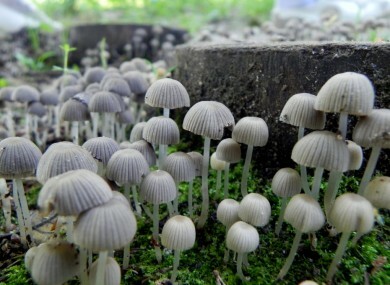 Could magic mushrooms be used to treat pneumonia patients? Irish researchers are attempting to find out. SOME €13.5 MILLION is going to be spent on medical research projects in Ireland over the next five years, Health Minsiter Leo Varadkar announced today. A total of 36 projects will be funded by the Health Research Board (HRB), covering areas such as cancer, HIV and pneumonia. Professor Neil Rowan will head up a team of scientists at Athlone Institute of Technology and NUI Galway who are looking into how a combination of stem cells and a component of magic mushrooms, Beta-1-6-D-glucans, could be used to help pneumonia patients. The researchers hope that the study could lead to an alternative to antibiotics. Pneumonia accounts for 5% of deaths in Ireland. It is the most common cause of acute lung injury and acute respiratory distress syndrome where there is currently no specific therapy. “This will hopefully impact on patient care by offering a new therapeutic intervention, something that doesn’t exist at this moment in time,” Rowan said. The successful research projects were selected from a long-list of 190 applications. Thirty two of them will receive funding of up to €330,000 and must be completed in three years, while four will receive up to €800,000 and will be completed within five years. The research teams are spread across Ireland, with researchers linked to TCD, UCD, NUI Galway, UCC, RCSI, Athlone Institute of Technology, Maynooth University and University of Limerick. Dr Patrick Mallon is leading a team in UCD that will be researching how to limit bone loss in HIV patients on anti-retroviral drugs. As people with HIV now live into old age because of the success of anti-retroviral therapy (ART), long-term effects of HIV and its treatment, such as osteoporosis, are becoming major issues. The group will conduct a clinical trial on 80 people with HIV who are about to start ART. Participants will either receive a short course of alendronate or a placebo taken weekly for 14 weeks. The study will determine the loss of bone density over the first year of ART between the two treatment groups. Meanwhile, Dr Juliette Hussey from Trinity College will be assessing the effect of diet and exercise in helping patients who are recovering from surgery for oesophageal cancer, the sixth most common cancer in Ireland. Hussey noted that there is currently a low survival rate for people with this form of the disease, but said this is improving. Varadkar has announced €13.5million for #research into cancer, antibiotics and other treatments. The Government might well be keeping a close eye on one of the projects in particular. Dr Steve Thomas from TCD will be looking into what Ireland needs to do to successfully implement universal health care. Varadkar announced the funding at the Royal College of Physicians of Ireland in Dublin today. He said that the investment highlighted “the Government’s commitment to developing new research in areas with a clear health benefit, as well as developing new approaches to health care, and boosting the medical science sector”. Every treatment, every medical device and every procedure in our health service starts with a good idea that has been proved in practice. Email “Could magic mushrooms be used to treat pneumonia patients?”. Feedback on “Could magic mushrooms be used to treat pneumonia patients?”.